Grew Up... in Vienna, in a family of famed businessmen. When they learned of Niki’s racing ambitions, he knew his days in Vienna were numbered. Living… for the next race. Even in Bourne, England, where British Racing Motors is based, the fear is everywhere. Niki’s not afraid of acknowledging that he lives with this fear everyday. He knows the statistics of drivers getting injured or killed. But he’s not going back to Vienna. His car is his home. Profession… driving Formula 1 race cars. 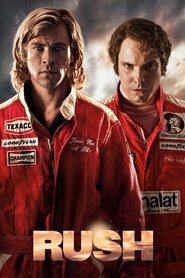 Niki can’t stand that history will likely remember him as James Hunt’s rival. Niki’s the only driver in history to complete the famed Nürburgring circuit in under 7 minutes. He takes his profession seriously, without all the rockstar trappings that James is so eager to assume. That makes Niki less exciting to write about and cheer for. But it keeps him on the top-shelf, which is all he wants. Interests… none really, other than racing. He views that single-minded focus as the key to his success: “I’m relentless. I don’t screw up. I go to bed early. I look after myself, look after my car. And then, soon as the race is finished, I go home.” To him, it’s the only way to operate. Relationship Status... dating socialite Marlene Knaus. She’d probably make a good, stable, supportive racing wife. Challenge… getting the respect he thinks he deserves. Niki resents the attacks James makes on his driving. Niki drives how he lives – with honor, a thankless virtue, or so it seems. James drives with oversized tires yet is the first to accuse Niki of cheating. The hypocrisy is insulting to Niki and the sport. Niki can’t wait to put the rivalry to rest – not in the newspapers, but on the track. Personality… monkish and relentlessly determined. His ambition is tempered by the wisdom that history always reduces us to less than we are. He finds the idea of legacy-building impure and unfair. A driver’s legacy or image won’t do him much good on the track. Niki Lauda's popularity ranking on CharacTour is #3836 out of 5,000+ characters. See our top-ranked characters and read their profiles.